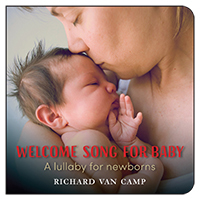 Richard Van Camp, internationally renowned storyteller and bestselling author of the hugely successful Welcome Song for Baby: A Lullaby for Newborns, has partnered with award-winning illustrator Julie Flett to create a tender board book for babies and toddlers that celebrates the potential of every child. With its delightful contemporary illustrations, Little You is perfect to be shared, read or sung to all the little people in your life—and the new little ones on the way! "A contemporary Metis child and his family are shown as the child grows from infancy to toddlerhood. Joy in life and the world about them are lovingly depicted in spare, but evocative text that is paired with Flett’s exquisite mixed-media illustrations." "Both the language and artwork is sophisticated in this board book that welcomes a new child into the world and explains how important he or she is to their parents...There is a smoothness and softness to both the message and the rhythm of the text, to which little ones will respond...The collage-style art featuring an Asian family has a warm elegance that parents will enjoy and whimsical touches that will appeal to children." "This tender celebration of babies features gentle rhymes and warm, understated illustrations...The art has the look of cut paper, with distinct lines and pleasingly curved shapes...Eschewing the overt cuteness often seen in board books, the artist captures the toddler’s joy in subtle, but tangible images...The family feels real and specific, and the message...will resonate with all readers." "The spreads lovingly depict a young child growing from infancy to toddlerhood...The text has the gentle cadence of a lullaby...Flett, who is of Cree Métis heritage, gives each character tawny skin, almond-shaped eyes and dark hair. This, combined with her sophisticated and simple style, allows her featured family to represent relatively broad branches of the human family. The art, with the look of cut-paper collage, uses curved forms and playful prints to flesh out the affectionate tableaux...The soothing rhythms of the language and the affection of the scenes are right on target. A poetic and joyful celebration." "A celebratory homage to newborn children and the joy they bring to their families. 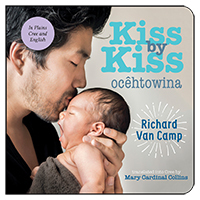 In a sensitive three-verse poetic text, author and storyteller Richard Van Camp evokes the love and commitment parents have for their offspring. The writing is meditative in nature...Julie Flett's unique pencil, watercolour and gouache collage illustrations are an exquisite partnering with the text...The colourful patterns on the parents' and child's clothing add visual interest in the artwork, which is otherwise striking in its simplicity.This beautiful board book will particularly resonate with parents, grandparents and caregivers of newborns as they begin their life's journey together." "Charming and fluid, Richard Van Camp has unlocked the keys to the heart, beautifully expressing how parents feel about their own baby...This touching and joyful tale Little You takes us on a heartfelt and peaceful journey of raising baby...Encapsulating the serenity and enchantment of Van Camp's words, Julie Flett illustrates...in an elegant monochromatic autumnal palette...Simple clean lines, geometric shapes and the beautiful use of negative space are a delight at each turn of the page. Taking us on a journey of the pure love from season to season, daytime and evening, indoors and outdoors...A little book with a bigger heart, much, much bigger than little!" 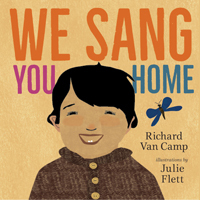 "A sweet little board book...Richard Van Camp has written a beautiful poem that describes the feelings of parenthood...The illustrations, done by Julie Flett, are both simple, and bold at the same time...and helped bring such beautiful words to life. I would recommend this book to anyone who enjoys curling up with their little one with a good book. It's a nice quick little read, that captured my little one's attention right away. It's got a great message that I hope she'll remember for the rest of her life." "This board book is meant for the very youngest "listeners" as well as a good gift idea for new parents or soon-to-be parents. The quiet verses are warm, cozy and heartfelt. The illustrations show a family of people with darker skin (the author and illustrator are Canadian aboriginals) which would make this book appealing to people who are non-Caucasian, thus widening its appeal. A wonderful addition for public libraries." "[Has] a quiet lyricism and poetic flair...Thunder, star, breath and ember provide images for the parents' love of this small baby—small in body but great in wonder. The clean lines and subtle colour contrasts in Flett’s illustrations are an apt complement to Van Camp's evocation of love, festivity and natural wonder." [Starred review]"Van Camp composes a lyrical ode to a newborn child, which is matched in its loveliness by Flett's exquisite, collage-like images of a young one with his or her parents. Both collaborators are of aboriginal Canadian descent, and the book will have particular appeal for families looking for nonwhite representations of tender family moments. But families of every size, shape, and background can appreciate sentiments like, 'You are life and breath adored/ You are us and so much more/ Little ember with growing light/ Feel our love as we hold you tight.'" "The brief poetic text speaks to the delight that a child has brought into its parents' lives...Flett's illustrations of a Metis or First Nations family, consisting of mother, father and child, capture their close physical and emotional bonds. 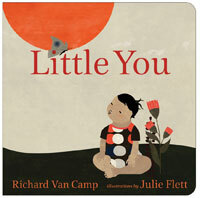 Little You is an excellent purchase for public libraries as well as being a good gift for new parents! Highly Recommended."